Below are additional information resources we hope you’ll find useful. 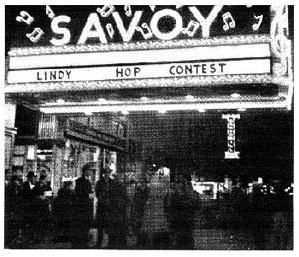 Click on the link for information on Lindy Hop and Balboa. For info on dance clothes, vintage clothes, shoes for swing dancing, what to wear, where to get it, etc….. click this link. 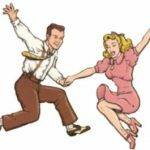 Before proceeding to the “10 Ways” below, one overall piece of advice – – learn the original swing dances: Lindy Hop and Balboa. In swing dancing, you can’t separate the dance from the music. Learning and becoming proficient at Lindy Hop and Balboa will help you connect to the music and gain a much greater appreciation for the dance itself. Yes, it’s true, at a lot of swing dance events the pre-dance lesson is often a “step, step, rock step” type of lesson. But that lesson is designed to get those up on the dance floor that have never danced before or have little dance experience. So as you progress, don’t settle for anything less than the original swing dances: Lindy Hop and Balboa! 1 – Keep on learning, but be discerning. Lindy Hop and Balboa should be seen as a journey, not a destination. Good Lindy Hop and Balboa dancers are life-long learners. Workshops. Attend national level Lindy Hop and Balboa workshops – it’s really that simple! You’ll never reach your full potential if you don’t attend national level weekend workshop events on a regular basis. How do you know if a workshop is a good Lindy Hop or Balboa national level event? Check out the Hepcats calendar page for some national level weekend workshop events. Classes. Take classes from good Lindy Hop and Balboa instructors, plus you should take private lessons from those instructors. (And it bears repeating, attend as many good national level Lindy Hop and Balboa workshops as possible.) How do you know what makes a good Lindy Hop and Balboa instructor? 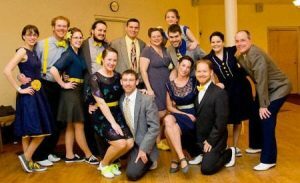 (a) Seek out instructors that have a proven record of accomplishments in Lindy Hop and Balboa. Ask yourself these questions: (1) Have the instructors competed in local, regional and/or national level Lindy Hop and Balboa competitions? (2) Do you see the instructors participating in jam circles? (3) Are they, or have they been, a member of a performance group? Don’t be taken in by an “instructor” with a few “flash and trash” moves, but with little technical ability and understanding of the dance. (b) Also beware of dancers in your local scene that may try to “help” you. As noted above, it’s easy for beginner swing dancers to be impressed by other dancers with little technical ability, but have a few “flash and trash” moves. Beware of those that offer to “teach” you or “show you a new move”. Be careful who you listen to, take advice from and let “teach” you. Ask yourself the same questions about them as you would any instructor: (1) What makes that person qualified to “teach” you: are they really good Lindy Hop and Balboa dancers? (2) Are they, or have they ever been, a member of a performance group? (3) Have they competed in local, regional and/or national Lindy Hop and Balboa competitions? (4) Do you see them participating in jam circles? Use the original swing dances as your primary framework. A hallmark of Lindy Hop and Balboa is the ability to be creative and innovative on the dance floor, and of course that’s great. But always look to the original swing dances as your main point of reference, and as a framework for your dancing. 2 – Be patient, stick with it, and practice. Sometimes dancers (of all ability levels) will find they seemed to have reached a “plateau”. If you find yourself at a “plateau”, don’t give up. 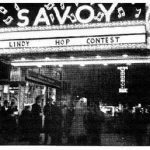 View some vintage video of Lindy Hop and Balboa for ideas and inspiration. Practice your basic steps and patterns and add something different. Practice is important if you want to maximize your potential. One note about practice. Practice doesn’t make perfect – good practice makes perfect. Make sure your technique is solid – technique is something you should continually work on and improve. If you practice with bad technique, you’ll just continue to reinforce bad habits and bad technique. Classes, workshops, and practice are really important. But those should be combined with social dancing at venues with good swing music. 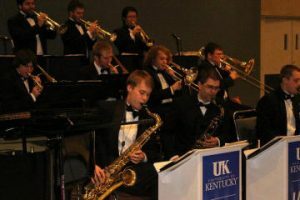 Take advantage of any Hepcats swing dance events, especially those with live music. A swing dance event with good live music can be an exhilarating and inspiring dance experience. Go swing dancing at other good out of town dance venues. Experience different dance floors and dance venues. Lindy exchanges are a good way to experience different types of venues and swing dance scenes. But take note: you should not attend Lindy exchanges in lieu of attending workshops. A good rule of thumb is that you should attend 2-3 workshops (both weekend and one day workshops) for every Lindy exchange you attend. Most people only have a certain amount of resources (i.e. time and/or money) available for swing dancing; so use a majority of those resources to attend workshops! 4 – Listen to and learn about great swing music. Being able to hear and interpret the breaks and phrases of the music are essential if you want to be able to dance to the music, rather than just dance. Note there is a lot of music played in 4/4 time that people “swing dance” to, but that doesn’t make it swing music. (Go to a West Coast Swing, Ballroom, or a Bop Club event to see what I mean.) Many swing dancers say that the ability to physically express and interpret the music you are dancing to is what “ties it all together”. For more info about swing music, click here. 5 – Participate in jam circles, enter competitions, join a performance group. 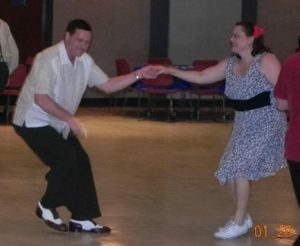 One of the best ways to take your swing dancing to the “next level” is to participate in “competition” type activities (of course, friendly and fun competitions). Participating in competitions, be it a jam circle, a performance group, a couples contest, a Jack and Jill contest, etc…gets the competitive juices flowing and is often a catalyst for individual improvement. Friendly and healthy dance competitions also bring excitement and enthusiasm to the swing dance scene, and often inspire other swing dancers to take their dancing to the next level! 6 – Honestly evaluate your dancing, get feedback. 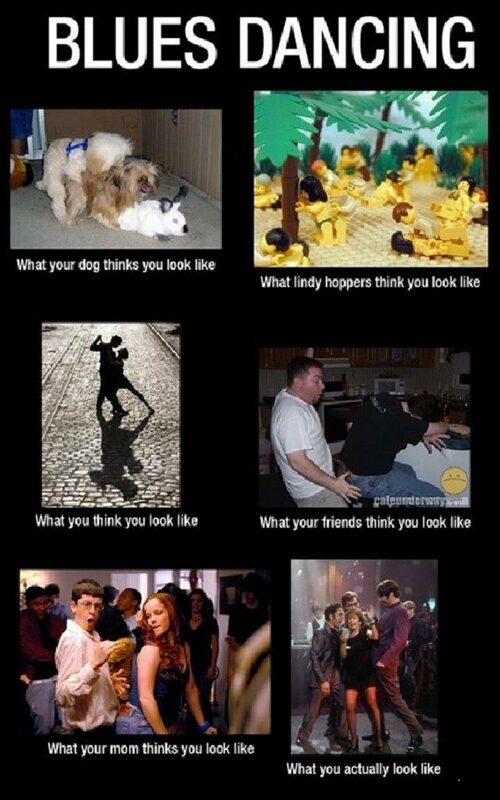 On a regular basis, honestly evaluate your dancing. 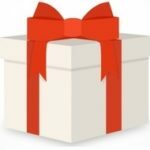 (a) If you enter contests (which you should), are you getting good marks from the judges, are you making the finals (especially for local and regional level competitions)? After the contest, ask the judges for feedback on your performance and use that information to improve your dancing. (b) Seek out feedback/advice from your local area’s best dancers/instructors. Once again, be careful who you ask for that feedback/advice. Use the same criteria as you would in selecting an instructor for a group or private lesson: (1) Has this person competed in local, regional and/or national level competitions? (2) Do you see this person participating in jam circles? (3) Is this person a member of a performance group? (4) Are they really good Lindy Hoppers and Balboa dancers, or do they just have some “flash and trash” moves. 7 – Dress the part. (a) Yes, dressing nice will actually help you become a better dancer! If you look good, you’ll feel good about yourself, and you’ll dance better. Check out this blog post by Lindy Hopper Dax Hock, “Sweat Pants Almost Killed the Lindy Hop” – good information! (b) If you dress nice, other people will want to dance with you. Remember: dancing is a social activity and you’re interacting with other people, so try to look like you care! Think about it…guys, do you think women will want to dance with you or be attracted to you if you’re wearing ratty looking blue jeans, cargo pants, sweatpants and a dingy looking, smelly t-shirt? Ladies, do you think guys will want to dance with or be attracted to a lady that looks frumpy and dowdy? It bears repeating, for both guys and girls – dress nice! 8 – Don’t be shy. 9 – Stop doing steps and patterns. Yes, at some point, you’ll want to move from being a “steps & patterns” dancer to becoming a dancer that dances to the music. Sure, we all like to learn new steps and patterns. But a huge part of swing dancing is about connecting to the music and your partner. Take time to listen to good swing music; feel the beat; feel the pulse; become familiar with swing music phrasing, etc…. it’s really not that hard and will make a world of difference in your dancing! As soon as you become a barely competent dancer, other people will start telling you how great you are. Sure, compliments are nice, and we all like them, but take those with a grain of salt, especially from those dancers whose ability level is really not much better than yours. And remember there are always better dancers out there, and there is always more you can learn.